May was MYP Reflective month: “We thoughtfully consider the world and our own ideas and experience. We work to understand our strengths and weaknesses in order to support our learning and personal development” Teachers reflected on their students’ traits, and nominated the following six students who display and practice reflection in the classroom. 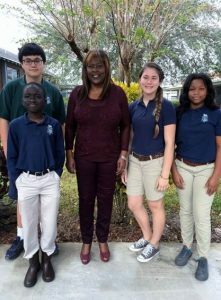 Mrs. Robinson, 8th grade Language Arts Teacher, nominated both Danielle Owusu and Lylah Baird. Mrs. Robinson noted that Danielle demonstrates continuous use of reflection to think beyond what is obvious. She also shared that Lylah uses reflection to build new and useful ideas for forward personal progress. Maralee Thompson was nominated by her Math teacher, Mr. Ostberg, because she has a natural ability to reflect on concepts learned in math and understand how they would be useful in real world situations. This ability to think critically and apply concepts makes her able to easily solve the more complex word problems that many of her peers struggle with. Fellow 7th grader Kierra Creve-Couer was selected by Mrs. Aycock, Science teacher, because she reflects seriously on all her work and is always willing to share those thoughts and help others achieve success in class. Mrs. Aycock also nominated Carlos Gabriel, 6th grader, for his in-depth reflection and careful attention to detail. He does very well and is a team player. She noted “Our prosthetic leg team project required reflection at the end to assess the pluses and minuses of their projects, and his thoughts were extremely detailed.” Lastly, 6th grader Mikhaiyah Reaves was nominated by Sr. Colon, Spanish teacher, because he noticed that Mikhaiyah was being much more reflective on her own weaknesses and strengths in Spanish class, and that this quarter she has been more aware and concerned about her progress. 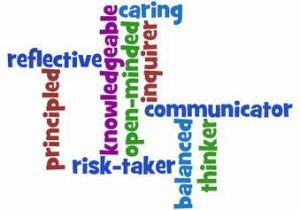 As we reflect on the 2017-2018 school year at Jewett Middle Academy Magnet, we are very proud and thankful for our many wonderful, hardworking students who strive to display our 10 MYP Profile traits throughout the year. We also appreciate all the teachers who took the time to reflect on each month’s MYP trait and submit their nominations. Teachers were asked to nominate students who displayed this characteristic. Many names were submitted, and we are very proud of all who show this skill in the classroom. The learning rewards of appropriate risk-taking are valuable skills to bring forward to high school and beyond. Please read below about our six students selected this month. Our 7th grade Risk-Takers are Brandon Sampath and Alfredo Herrera. Both were nominated by their math teachers – Mr. Ostberg (Brandon) and Ms. Donald (Alfredo). Math is a subject where students are encouraged to step forward and take the risk of trying (and possibly failing) in order to stretch their understanding. Mr. Ostberg shared, “Brandon is always bold in class when he has a question and he is never concerned about standing out and expressing his opinions. 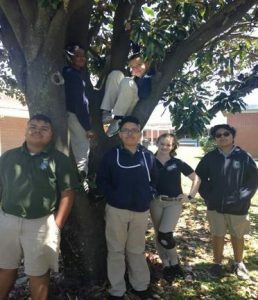 He has a very unique personality and he is not shy to take a risk and put himself out there to make a point or express himself.” Additionally, Alfredo demonstrated to Ms. Donald in Algebra Honors class his “thirst” for math since the beginning of the year. “I have observed him thinking and strategizing how to solve the more challenging problems. The most remarkable encounter that I recall is when I shared the word “slope” with the class when we did functions. The term was not introduced to the class, but only a nugget for the students to hold onto until later in the year. Alfredo refused to just “hold” to the nugget, but he took the initiative to find out more about the term. He shared with the class, “per GOOGLE,” that slope is y –y/ x-x and it is the same as Delta y/Delta x. I replied, ‘Wow, HOW you know about Delta?’ He stated, “when in doubt seek GOOGLE.” Not only did he tell about his findings, but, Alfredo was willing and bold enough to show his peers how to find the slope. He continues to “stretch” his thinking even when in doubt. The other students now call him “Google-Man” because he uses other resources to help provide clarity when he struggles on an algebra concept. We also one teacher, Mrs. Scarvers, who states Risk-Taking is her MYP Profile trait. Looking forward ….. April is BALANCED month. Congratulations to this month’s MYP Profile trait students! February’s trait was Caring: We show empathy, compassion and respect. We have a commitment to service, and we act to make a positive difference in the lives of others and in the world around us. 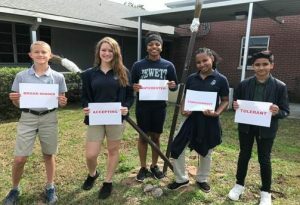 The following students displayed their Care and Compassion both in and outside of the classroom. 7th graders William Ball and Cameron Weeks were selected for their caring and considerate actions in the classroom. Mr. Ostberg, William’s Math teacher, noticed that William seems to genuinely care about the feelings of others and will often times stick up for students who are having rude comments made about them. He shared, “I also see him being a good listener to students who seem to be going through a difficult time.” Additionally, Cameron Weeks really made an impression on Mrs. Mack recently in her Speech and Debate class. Here is the story that Mrs. Mack shared: “I have a student who has severe anxiety about getting in front of people and doing any type of oral speaking. As a matter of fact, the student was very nervous and cried during their first speech we completed. 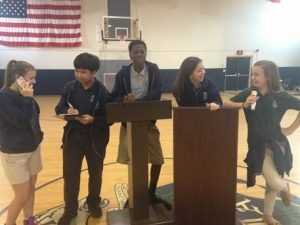 Fast forward to 2nd semester, it was time to get up as a part of the debate team. The student took a deep breath and came to the debate table to participate. It started off a little shaky, but I saw a smile towards the direction of the student’s group, and was curious what was going on. I saw a sign propped up on a book bag that said ”YOU’RE GREAT!”. This sign helped the student’s confidence, such that they did a fantastic job! After the debate, I asked who made the sign. Cameron showed an enormous amount of compassion for his peer. He recognized a time where he could act to make a positive difference! This one act of Caring actually brought my entire class closer, and it prompted a conversation about how we can encourage each other!” Wow!! We are so proud of these students for their Care and Compassion! We also have two men on campus who have CARING as their top MYP Profile trait. What a great example they are to our student body! March’s MYP trait is Risk-Taker. The following students displayed their Open-mindedness both in and outside of the classroom. Well done students. 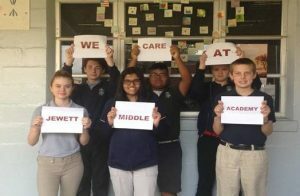 We appreciate the example you are showing to the students at Jewett Middle Academy. February’s MYP trait is Caring. December’s MYP trait was PRINCIPLED. We act with Integrity and honesty, with a strong sense of fairness and justice, and with the respect for the dignity and rights of people everywhere. We take responsibility for our actions and their consequences. 8th graders Nathaniel Eary and Harli Fountain displayed how truly Principled they are. Here is what Mrs. Colon wrote: “Nathaniel is absolutely a student who is honest and has a great sense of fairness and justice. Although he tends to be quiet in class, he respects all his classmates and always show his character of honesty and discipline. Nathan takes his academics very seriously and strives to do his best all the time.” Coach Paige nominated Harli with absolute certainty, based on what she has observed in PE class this year. “I cannot think of a better student who exemplifies a sense of honesty, fairness, justice, respect and dignity of rights for herself and her peers. She is always willing to help where help in needed. Harli is accountable for her actions and shows integrity. She also demonstrates credibility and good sportsmanship. We are so proud of all our students!! January MYP Trait is OPEN-MINDED. 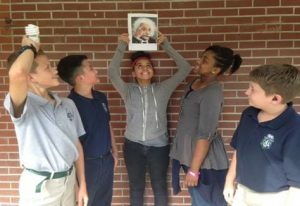 November’s MYP Profile trait was Communicators – We express ourselves confidently and creatively in various ways. We listen to other perspectives and collaborate effectively with both individuals and groups. Congratulations to the following 7th and 8th graders who displayed their strong communication styles in class this past month! Way to go! You make Jewett Academy proud! Congratulations to our October MYP THINKERS! MYP Thinkers use critical and creative thinking skills to analyze and take responsible action on complex problems. Teachers nominated their MYP THINKERS, and it was very difficult to select from so many strong candidates. The following students were selected as Jewett Academy’s MYP learner profile students. 7th graders Tristan Hendry and Mai Xian Liang-Danio were selected this month as displaying strong classroom Thinking skills. Mr. Ostberg noted in Math class Mai always seems to come to the correct answer to complex word problems by finding creative solutions. He also states that Mai shows strong abilities to think critically and analyze with ease. Tristan was nominated by both Ms. Donald and Mrs. Aycock. They both recognize his super “outside the box” approach. In Algebra Honors, Tristan expands his learning of math concepts by applying them to real world situations. 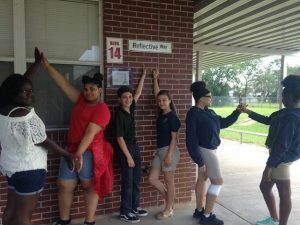 In Mrs. Aycock’s Accelerated Science class, she shared that Tristan demonstrates a vast knowledge of science and is constantly questioning new outcomes and possibilities. Our 6th grade selected Thinkers are Noah Winn and Jailyn Williams. In Art class, Mrs. Bonadies noticed that Noah takes every instruction and comment in class to a higher level. He demonstrates that he is continually analyzing what is occurring around him. Lastly, Jailyn was also recommended by two teachers for her outstanding thinking skills. Mrs. Aycock shared that Jailyn is a student who goes above and beyond to analyze new data being taught in class. In Mrs. Kendrick’s History class, Jailyn displays strong thinking skills and is also a conscientious learner. 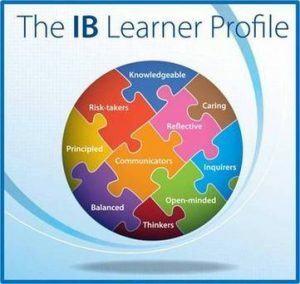 In addition, she strives to help others in class understand the assignment as well. Way to go students!!! Get ready for next month! November MYP Learner trait is Communicators. Congratulations to our September MYP KNOWLEDGEABLE students! 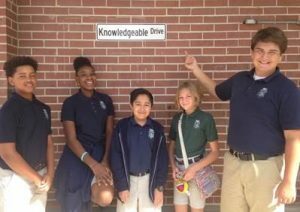 Knowledgeable MYP students explore ideas and have acquired a critical mass of knowledge. They engage both locally and globally, sharing their understanding with others. Teachers nominated their MYP Knowledgeable students, and it was very difficult to select from so many strong candidates. The following students were selected as Jewett Academy’s MYP learner profile students. 8th graders Jalen Hairston and Jackson Holby made an impact in the classroom this past month. Mrs. Colon noticed how inquisitive Jalen is in Spanish class. He wants to learn and is not afraid to ask questions. He takes it upon himself to go above and beyond, learning new Spanish words outside what is assigned, which he then shares with Mrs. Colon and his class. Jackson puts his knowledge in action during Physical Science Honors. Mrs. Henderson noted that Jackson draws upon his prior knowledge, both from life experience and his extensive information from reading outside of class, to apply to projects and issues discussions in class. Two 7th grade girls knocked it out of the park this past month displaying their knowledge in Math and Speech & Debate class. Alexis Cashdollar was nominated by Mr. Ostberg because he noticed that she continually knows terminology and math concepts that her classmates struggle with or view as new. Although quiet in her personality, Alexis is one of the first students with her hands up to answer questions and share knowledge in class. Mrs. Mack is teaching a new class at Jewett Academy this year called Speech and Debate. She says “Sarahlee (Orphe) grasps the concepts taught in class quickly and utilizes skills she has learned in other classes.” She is also impressed with Sarahlee because she sees her mentoring and sharing knowledge with others in the class. Lastly, 6th grader Alexis Hernandez has shown Mrs. Shoffner what an incredible person he is. She notes “Alexis is always asking me if he can help others in Spanish class. He wants to share his prior knowledge of the language with others.” She has seen Alexis help students in a variety of ways, whether it’s with pronunciation, translating or giving his input, he always goes above and beyond to help classmates understand. The following Jewett Academy teachers also earn the title of “Knowledgeable” as their strongest MYP Learner Profile trait. October MYP Learner trait is THINKER. Congratulations to our August MYP student INQUIRERS! MYP Inquirers nurture their own curiosity and know how to learn both independently and with others. 6th grader, Bryan Olmert caught Mrs. Bonadies’ attention the first week of school. She noticed his curiosity and attentive eyes for every process developed and learned in class. She noted that Bryan also helps his classmates and works to find solution for class organization in Art class. 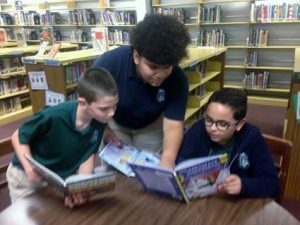 Mrs. Aycock says that 7th grader Allan Rivera “is the perfect example of an Inquirer.” Not only is Allan’s work in Accelerated Science class top level, but he volunteers to create Kahoots games to help his classmates study vocabulary science skills. 8th grader, Lylah Baird was selected from Mrs. Henderson’s Honors Physical Science class because she displays a natural curiosity to learn even more than what is being taught, and is enthusiastic with a positive attitude each day. The following Jewett Academy teachers also earn the title of “Inquirer” as their strongest MYP Learner Profile trait.